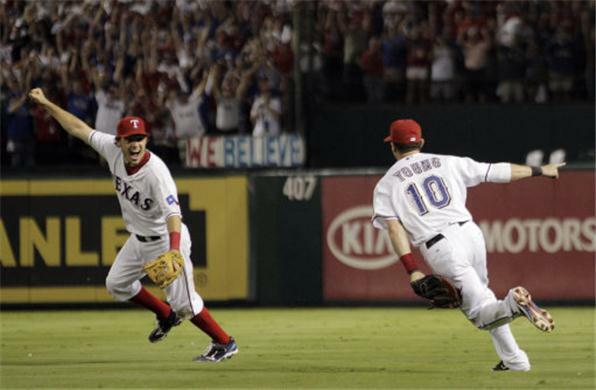 The Texas Rangers are one win away from winning their first World Series. Or so I’ve been told. I can’t watch baseball for four hours when my team isn’t involved. The Rangers actually made their first World Series appearance last year after 50 years of futility, leaving only two franchises without a trip to the Fall Classic. That brings us to our Question of the Week. Get it right and Josh Hamilton will share some non-alcoholic champagne with you. The answer, as always, is after the jump. Answer: Seattle Mariners and Washington Nationals. The Mariners have been trying for 34 years and the Nats for 42. That’s a lot of losing.